When you go for a government job interview, nine times out of ten you will be asked a list of set interview questions that are based on the selection criteria. The interview will generally go something like this. The chair of the selection panel will introduce the panel and explain the basic format of the interview. They may ask if you have any questions before you get started, or if you would like to introduce yourself briefly. If you are given the opportunity to 'tell us about yourself' this introduction is generally not assessed and what you say most likely won't have any effect on the interview outcome. It is just a time to get into the flow of talking about yourself. One of the panel members will introduce the first selection criteria and then ask a series of questions based around that selection criteria. Usually, one selection panel member will handle one selection criteria, and then hand over to the next selection panel member for the next selection criteria. This is where your notes will come in handy. If you have something important to say that relates to your claims against that selection criteria, make sure you get it out! The questions that you are asked may not cover all elements of the selection criteria and the selection panel will not have your statements addressing the selection criteria memorised, so ask if you can provide additional information if you don't have an opportunity to address your key strengths when answering the interview questions. The selection panel members will take it in turns to ask questions relating to the selection criteria, until all of the selection criteria have been covered. You may be asked towards the end to summarise your strengths and weaknesses (this usually only happens with inexperienced selection panels). You will probably be asked to confirm who your referees are. You will be asked if you have any final questions. It is good practice to ask the panel a few specific questions about the position, work area or department. It will show your interest in the position and allow for more general and less formal conversation with the panel (great for forming rapport and getting on their good side!) General questions about the position or working conditions are not appropriate and only show your lack of research into the position and general poor preparation for the interview. This is the most common format for a government interview, however it doesn't always happen this way. Sometimes it might not be evident what selection criteria the interview question relates to, and if you're not sure, it's fine to ask. The format generally skews from this the higher up the level of the position, with a lot of senior executive service positions taking more of a conversational tone rather than question / answer format. Looking for answers to interview questions? 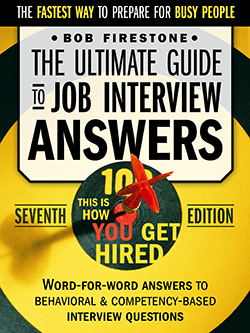 This guide not only covers interview questions that are common in both the public and private sectors, but it shows you what a good answer looks like. Find out what you should be saying and how you should be structuring your answers to interview questions. A fantastic guide that we recommend to all of our government job applicants. Read more about this ebook here.